In 1947 the development of Luing beef cattle was begun on a Scottish island of the same name by the Cadzow family, using Beef Shorthorn and Highland cattle as their base stock. 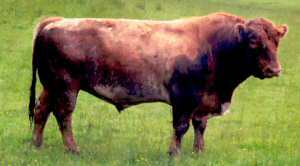 The intent was to establish a herd of "hardy cattle that would breed on the west coast and feed in the low lands". A Luing Society and Herd Book were established in 1965. The first sale at Oban in March 1966 attracted huge attention, and a cracking trade, with buyers in attendance from all over the UK. From the start Denis Cadzow was adamant that there should be no fads and fashions within the breed. Showing was not permitted and the breed was among the very first to have a minimum height insisted upon for bulls at its sales. 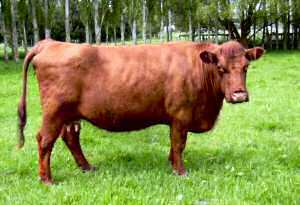 These red-brown cattle are moderately sized and extremely hardy, as might be expected from a breed developed in the western islands of Scotland. The Luing cow is an efficient and fertile mother. In a cold climate and on rough hill ground heifers have the ability to forage and produce enough milk to raise a calf, there is the advantage that the Luing do not have horns and are unable to damage themselves or their owners. Their strong bone structure and sound feet are a further "maintenance free" quality. Luings were first established in New Zealand in 1975 but did not achieve much popularity. There are currently only minimal numbers of the breed in this country – there are only three very small herds in Canterbury. 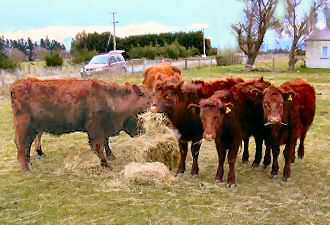 There is a herd of around 90 cows in Tasmania (Australia) – probably not all registered purebreds – and possibly some remain elsewhere in Australia and in South America. There are around 300-400 cows in Canada with only half that number registered, and in excess of 2000 registered cows in the UK, including 700 cows in the original herd on Luing Island. After the disaster of Foot and Mouth disease in the UK in 2001, many people are now desperately seeking the thrifty, easy keep, Luing cattle to restock herds. Demand for the breed will be at its highest level since its foundation. This proves once again the value of retaining these "rare" breeds as circumstances do change over time and different genetics are needed. of Iain Aitken (see » Medicine River Luings) in the compilation of this page.